Have you heard of Meetup? That brilliant online platform uniting like-minded peeps into offline communities? 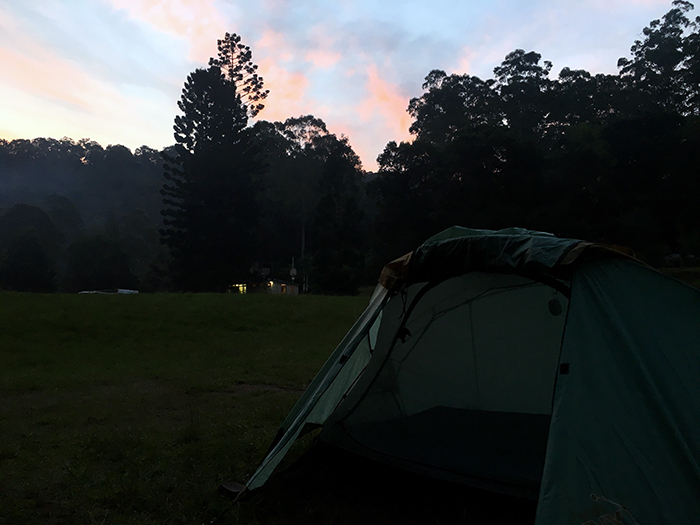 I’m a member of Sydney Weekend Adventurers, a wonderfully diverse group of people organised by a northern beaches couple who run a medley of outdoor adventures in Sydney or within a day’s drive. 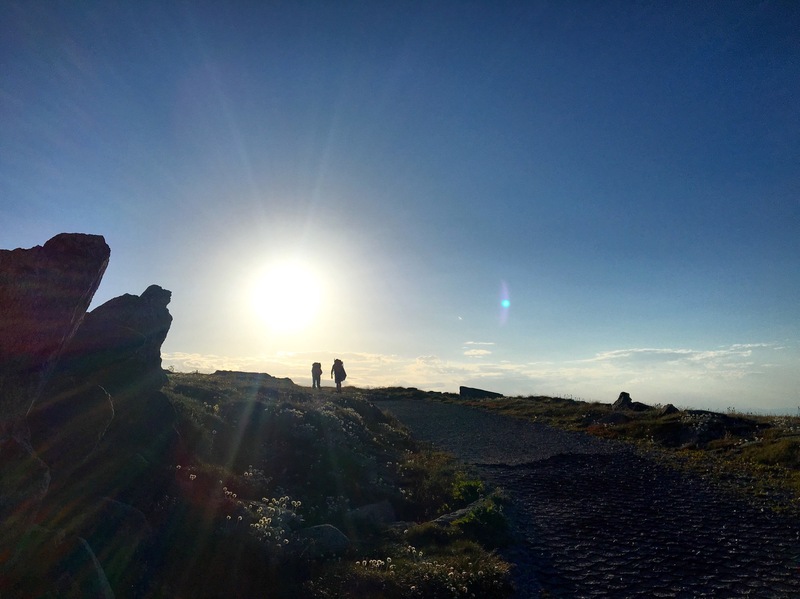 I was one of the first to sign up to a two-day adventure to hike Mount Kosciuszko under the full moon. Perfectly timed over a weekend, the plan was to enjoy Australia’s highest mountain by the moon’s silvery light, camp overnight near the summit and walk back down the next day. 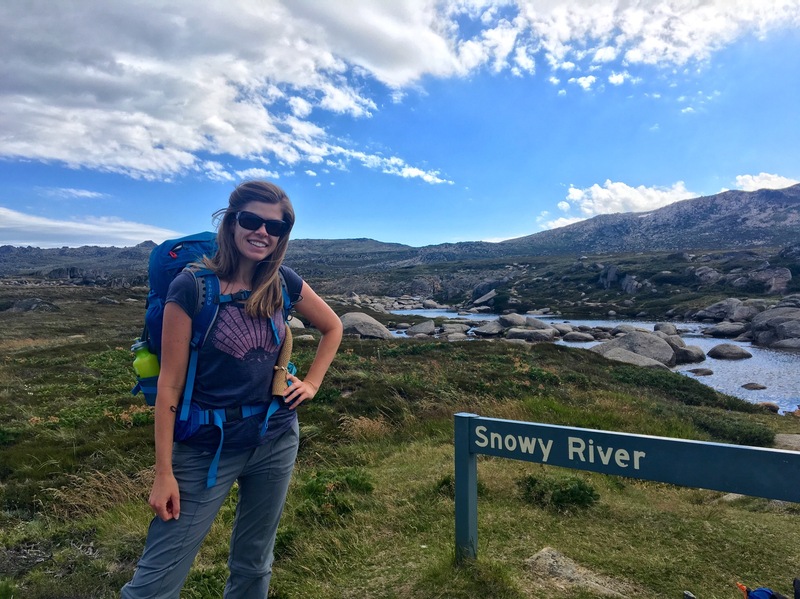 I had never been to Mt Kosciuszko before, and I was eager to test out the backpack I had just bought to take on my 900+km Camino in a couple of month’s time, so the trip was ideal for Camino preparation, and perfect end-of-summer-adventuring. It had been years since I’d been on an overnight hike but I was longing to get back into it despite not having much gear. If you’re in the same position – don’t worry and don’t let it hold you back. There’s only a few key pieces you need and it’s possible to get everything at a pretty affordable price thanks to stores like Anaconda and websites like Wild Earth that have good sales on all the time. Just keep a list of what you need and then keep your eye out for the right sale. 50% off backpacks one weekend, 40% off tents the next, and so on. Also, the outdoor community is so generous, if you’re just starting out then join a club or a Meetup group and you will be pleasantly surprised how helpful people will be to help you get out there! 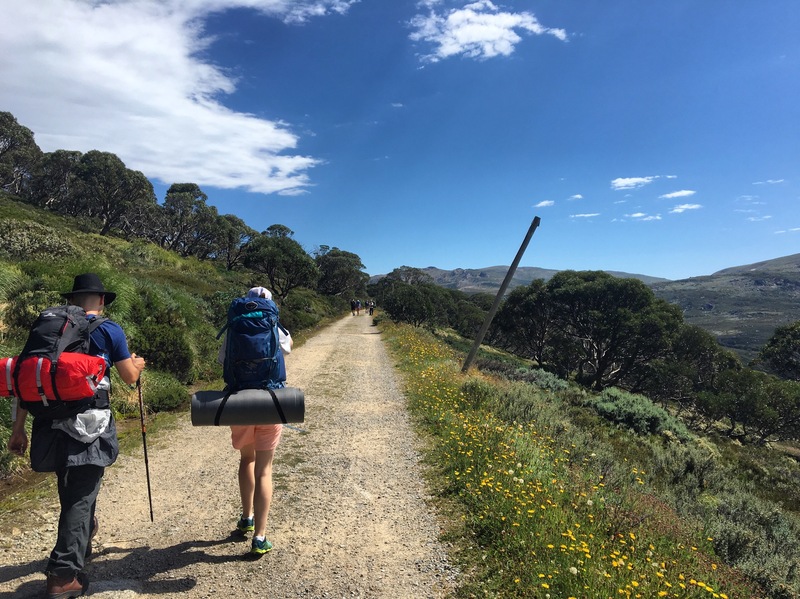 I made the 6 hour drive down to Jindabyne on Friday night after work with friends I’d made on previous hikes with the group, Megha and Jo. It was relatively easy getting out of Sydney despite the end of week traffic, but driving at night on the Hume Highway was hard work; there was just so much roadkill, which put me on high alert. So much poor Australian wildlife like kangaroos and wombats were lying on and by the side of the road at regular intervals, and at one point we ran over the top of a kangaroo that must have only just been knocked down as we shortly passed a couple walking back towards the roo from their car pulled over just past it. It was quite harrowing given the dark of the night and the size of the animals. Many more hopped across the road a couple of metres right in front of my car, or stood frozen in my headlights in the opposite lane. I kept my eyes scanning the road, fingers clamped to the wheel braced to avoid a collision – unfortunately that’s all you can do. Judging from the amount of roadkill the odds are not great for the poor natives. We stopped at a fairly nondescript roadside cafe for a quick dinner but we were eager to get a good night’s rest so we pushed on. 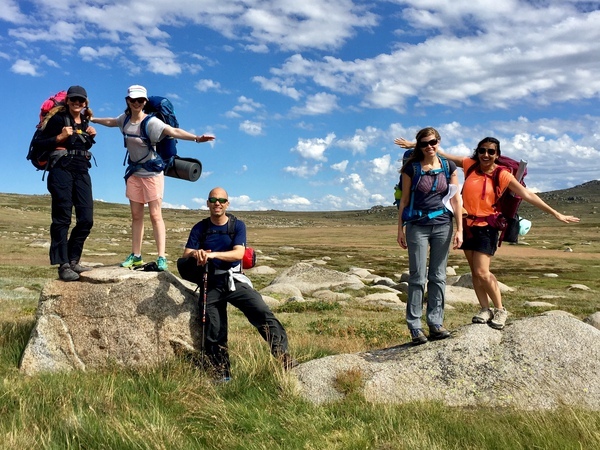 We planned to sleep overnight in a cabin at the NRMA Jindabyne Caravn Park. We had our camping gear for the following night’s hike but we knew we would arrive after midnight so it was great when we did pull up and could jump straight into bed! As usual I woke just before dawn the next morning, and on my way back from the toilet block realised we were right beside the very pretty Lake Jindabyne, backdropped by the Snowy Mountains. We made our way into Jindabyne for breakfast at Birchwood Cafe, my ability to sniff out the best coffee and food in town led us straight there (thanks foodie blogs), and it was the perfect spot to fuel up for the day ahead. We met the rest of our group at the meeting time but then had a slow start as we waited for everyone to gather. Then our group organiser Con updated us on the weather. It was being unpredictable, rain was expected shortly then then it should pass through and come back the next day, leaving us with a good afternoon and night to do our hike. That meant prolonging our departure, which was fine with everyone. Happy to eat and enjoy more coffee, and time to pick up any last minute gear we would need. Cold temperatures and rain were now guaranteed so most people ended up popping into the gear stores for something or rather. I ended up getting a pair of rain pants and a possum-hair beanie (yep, possum hair, very cosy but scratchy FYI). 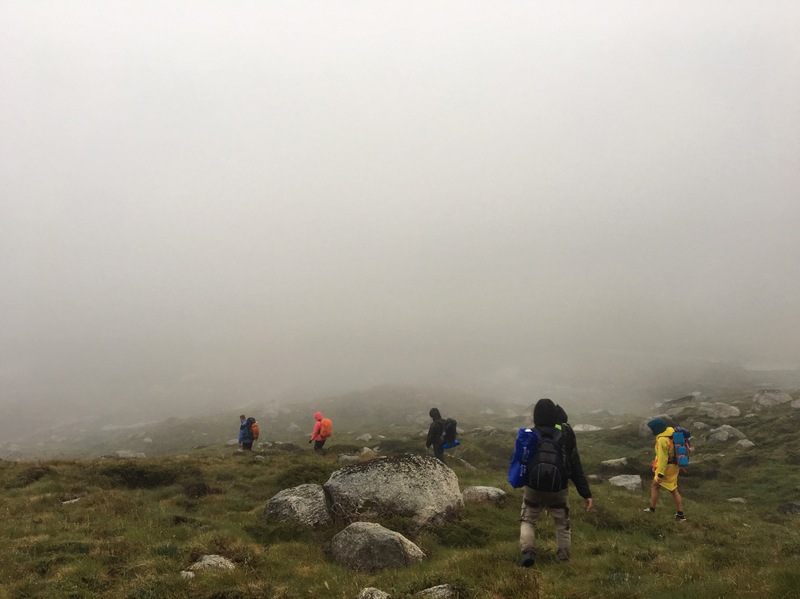 Rain pants had been on my ‘should I or shouldn’t I’ pack list for my upcoming Camino de Santiago, so it was a good opportunity to get them and test them out on Kosciuszko. Finally we departed Jindabyne by road convoy and drove about 50km or so to Charlotte Pass. A bit more fussing about as we piled out of cars, helping each other adjust our backpack straps and tie on gear, then we were off! We had a gorgeous sunny start, a true pleasure to walk along the wide track and enjoy the sunshine across the grassy mountain-side. 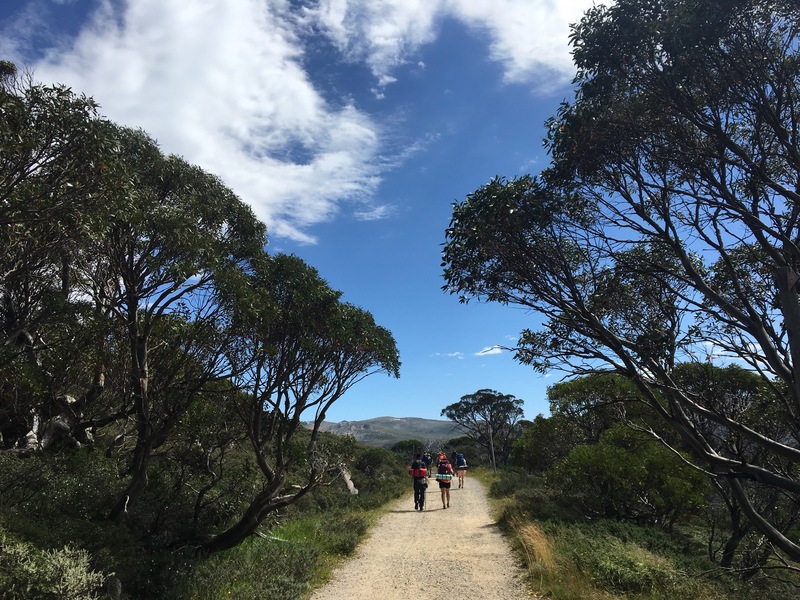 We set off on old Kosciusko Rd, crossing the Snowy River Valley to ascend the Main Range. 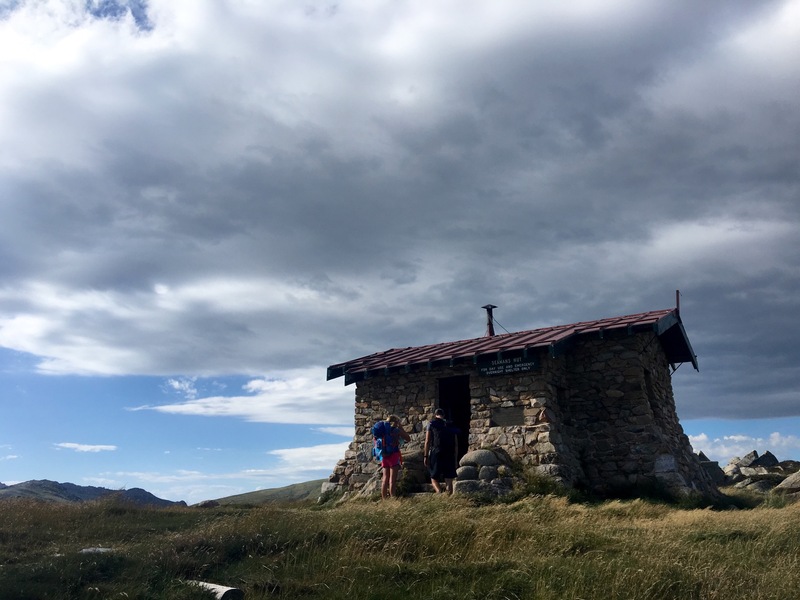 We passed by Seamans Hut, a monument built for two guys who lost their lives in 1928 after setting out skiing one sunny afternoon and then got stuck in a blizzard that swept into the range. A testament to the unpredictability of the weather in the mountans. We were lucky to continue enjoying good weather at this point, so we stopped to snack and rest awhile. We pushed on and passed the Snowy River, time for photos and snacking again! 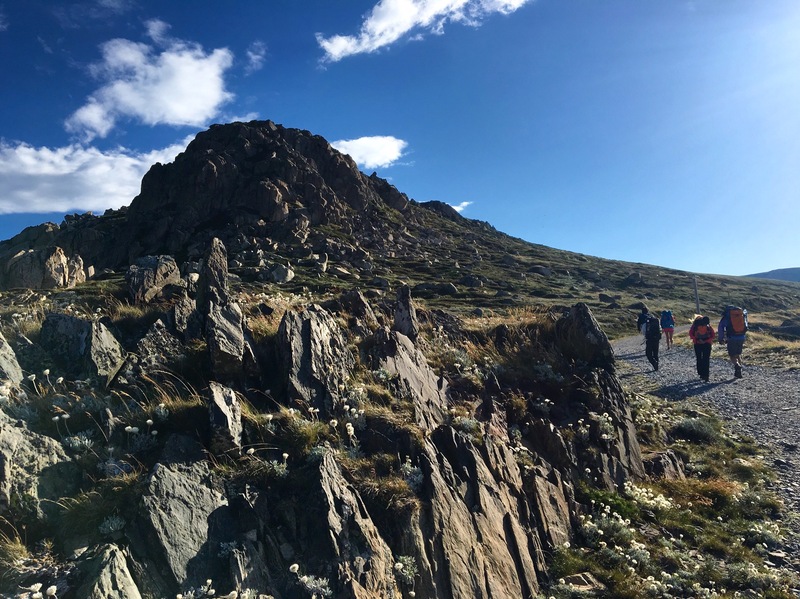 The afternoon walk to the summit was easy, a wide clear path the whole way with a truly beautiful and expansive landscape, the rolling fields and rocky peaks stretching in every direction. The sun was sinking as we started the last incline, the light was just amazing. My heart was skipping all over the place. I spaced myself out on the path eager to have the landscape and horizon to myself. The glimpses of walkers ahead of me and behind were meandering in the light and shadows. We summit-ed in time to take in the glorious view. We put on our extra layers in anticipation of the sun’s warmth leaving us, which it quickly did. We perched on rocks and ate our various picnic dinners, gradually growing quieter as the we watched the sun set and the full moon rise. The streaks of colour on the horizon cleaved the way to an inky purple, flaring with forks of lightening all around us in the distance. The storm the forecast couldn’t make its mind up about seemed to be skirting around us. It was mesmerizing to watch, the air was calm and quiet, but settled icily on my cheeks. I snuggled into my layers, I hadn’t brought much but I was happy they were all performing as intended. I was grateful for the research I’d done and the quality I’d bought. Even the last minute addition of the possum fur beanie. I settled into the stillness that only nature gives me, when I take the time to give myself over to it, when all that other life stuff drops off to where it belongs. Feeling free but connected, insignificant but worthy. 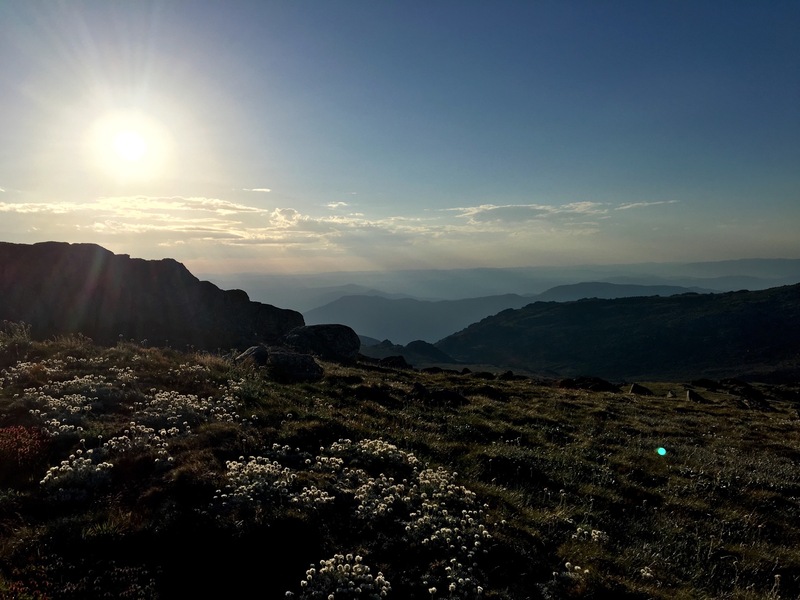 We couldn’t stay all night, we needed to hike on northwards along the crest of the Main Range to Muellers Pass, from there we intended to pick up a faint track that would lead us up to camp in the saddle between Alice Rawson Peak and Mt Townsend. 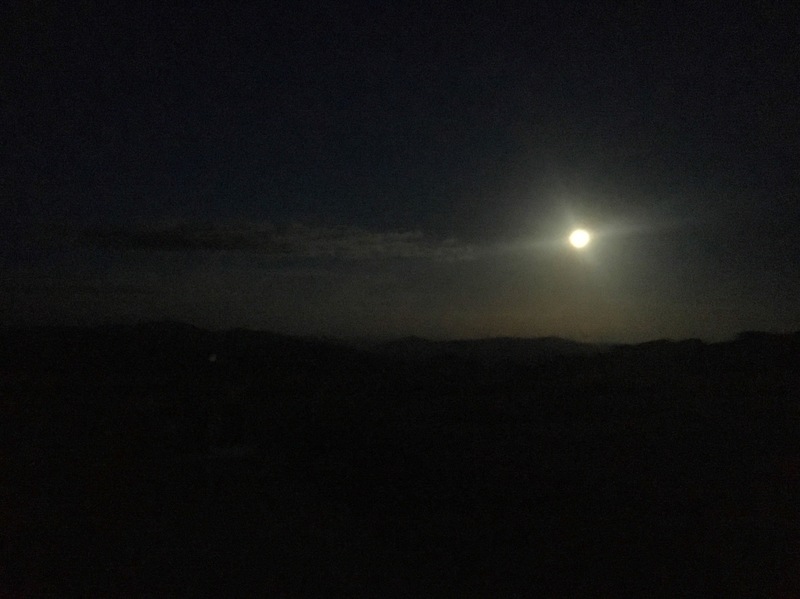 We hiked by the full moon’s glow looking for the faint signs of a ‘path less travelled’. Con had hiked it before, he knew vaguely where it was and that it would be hard to find. At some point he knew we’d walked past it, so seeing another path that should take us toward it, we took that one. Well, detouring at night, even under the magical powers of a full moon, is rife with potential to backfire. Our hiking became trudging. Our path became rock scrambling. Everyone grew quiet. The reverent atmosphere grew more tense as tired hikers, sore hikers, less experienced hikers became uncomfortable and stretched. I personally felt OK about the unplanned detouring. It happens, I felt prepared, and so in the situation I accepted the path as it appeared. I did find the rock climbing with my backpack challenging. 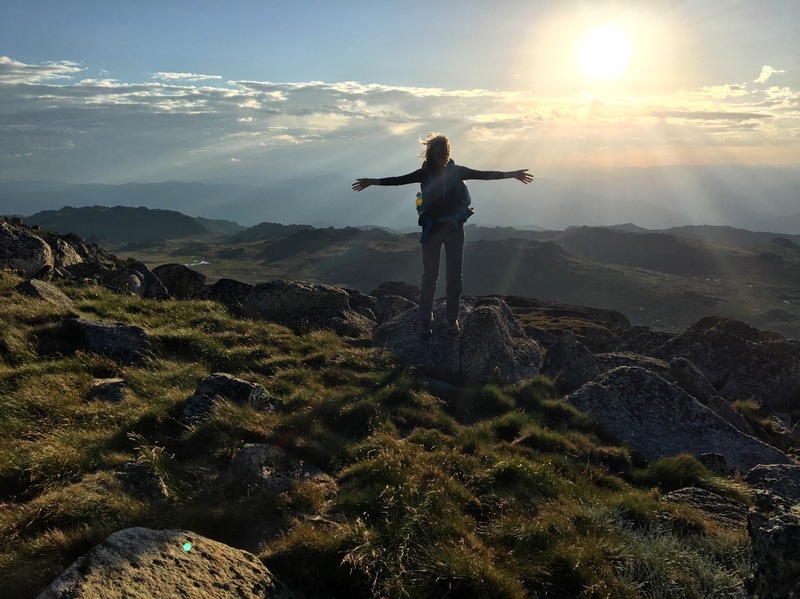 At times I was apprehensive knowing my usual centre of balance was off, the height in the dark made me nervous, and from that in wriggled doubt as I struggled with my own strength to pull my weight up and over large boulders. It was tough going, there were moments where I faced my limit and with effort pushed on past it. It was a suprising situation, it was meant to be a straightforward hike after all, but by the end of the weekend I would be really proud of myself for finding my inner strength and seeing what I was made of. Finally we reached the top but it was obviously not where we were supposed to be. 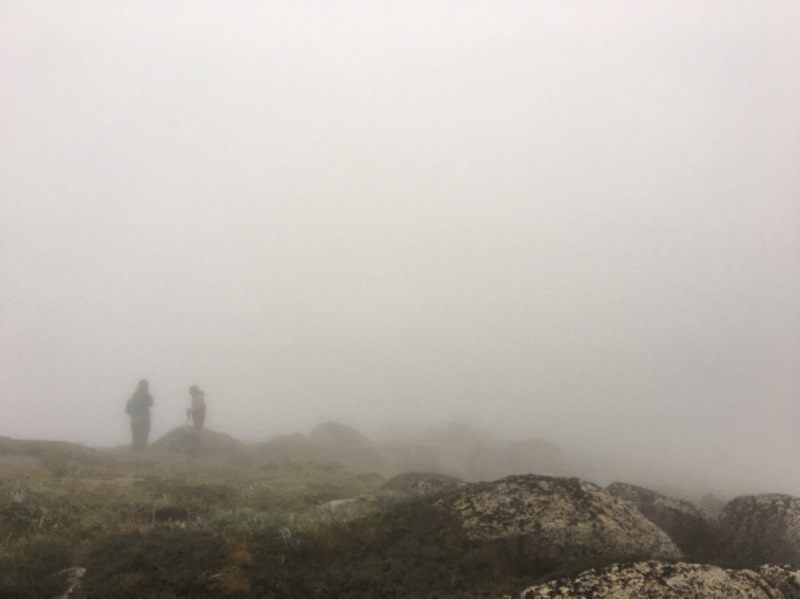 The grassy incline was strewn with boulders and shrubs, but the wind had picked up and we felt rain steadying to spit on us. Con told us all to set-up camp so in a flurry of activity we all unburdened our packs and tents started flying up. Megha and Jo were sharing a two-man tent and I had my brand new little one-person tent. With the wind whipping up around me and the energy in the air descending opressively around me I suddenly realised how little and light I really was on the mountain peak, so I nestled in between the girls and another guy’s two-man tent, hoping for a little protection. It was a tight squeeze once I started to hammer in the pegs for my fly, especially as the front flap ended up being exactly where a big boulder was! Thankfully Con came around with a spare elastic cord and helped me rig it up. The rain started descending so quick as rabbits we all hopped into our burrows. Tucked in my little haven I awkwardly shed my shoes and hiking pants and put on some thermals. 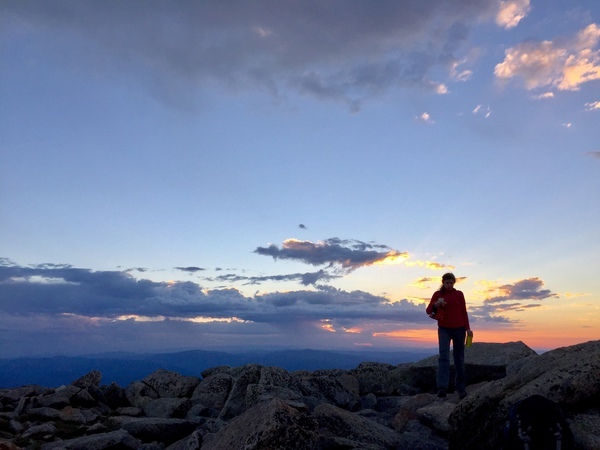 I only brought the half sleeping mag to save on space and weight, so with my upper body on the mat and my lower body on my backpack I wiggled into my sleeping bag and lay down listening to the wind and the rustle of my fellow hikers settling down. Gradually all other noises stopped and I closed my eyes wondering if I would get some sleep despite the excitement of being on a mountain top. It’s not every night you are one of the highest positioned people in the country. I must have dropped off, because at some point I became aware of the distant boom of thunder. I snuggled deeper into my bag and felt the thrill of being warm and cosy with the elements right outside my thin shell of nylon. I drifted in and out of sleep and was just becoming conscious of the pounding of the rain and the increasing frequency of the thunder when I heard a man’s voice raised in alarm outside my tent. “We don’t have time to take our gear, we’ll come back later, put wet weather gear on and get out”. I stopped again. I had packed everything already so I focused on getting fully dressed and into my rain gear while thinking “this is crazy, we can’t leave now, I’m safer here than scrambling around out there in the middle of the night” The scenes from only hours before replayed in my mind, my body perched precariously atop boulders, unbalanced under the unfamiliarity of my backpack weight. “Stay where you are, it’s too late! We’ll stick it out, stay until morning” and then he was gone. My gut instinct was relieved, I knew that was the right decision. Luckily I felt calm and prepared. I was all packed up, but wearing all my layers. I pulled out my sleeping mat and emergency blanket and wrapped myself up like a caterpillar. So, cacooned in my tent, an electrical storm passed through until the early hours. I later wondered if the emergency blanket was a good idea amidst the lightening but some later research indicates that was OK, though I probably should have kicked my backpack out of the tent (metal frame). Oh well, lucky escape. Listening to the thunder booming, lightening flashing and the wind buffeting my little safe haven was a truly awesome experience. I decided that I was going to enjoy it. 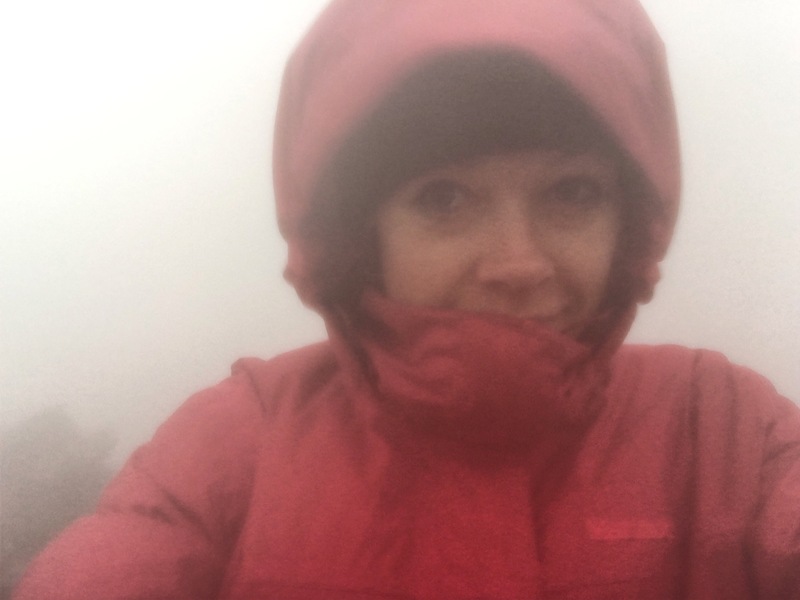 I would never plan to be on a country’s highest peak in the middle of an electrical storm, but here I was. I would let the sounds wash over me, I would feel the intensity of the energy in the air and give myself over to the majestic power of Mother Nature. A brief lull at 6am gave us the opportunity to pack up and make a foggy wet exit. Again the group was quiet and efficient, we helped each other, offered spare clothing to those who had gotten soaked during the night. There were varying degrees of people coping. Personally, I was pretty happy! The night was challenging and beautiful. My gear had held up wonderfully, and now hiking out in the morning I could test out my rain pants! We trudged down through the constantly changing landscape. There was foggy mist all around us, we could see then we couldn’t. I put my blind faith in Con to lead us out, but it wasn’t easy. Others in the group had reservations and opinions on where we should be heading. Megha realized she had GPS working on her phone and between her and some of the others they pieced together that maybe we were walking in the wrong direction. The mist obscured everything. I wished I was more capable of self navigating, I felt like I was no use so I stayed quiet and supportive, and didn’t complain. Finally we reached the river and could get our bearings. At that point we knew the path we were trying to take out of there was too risky to try to find with such low visibility. The group agreed to walk back to the route we had taken the day before and make a return trip on that instead of a loop as intended. 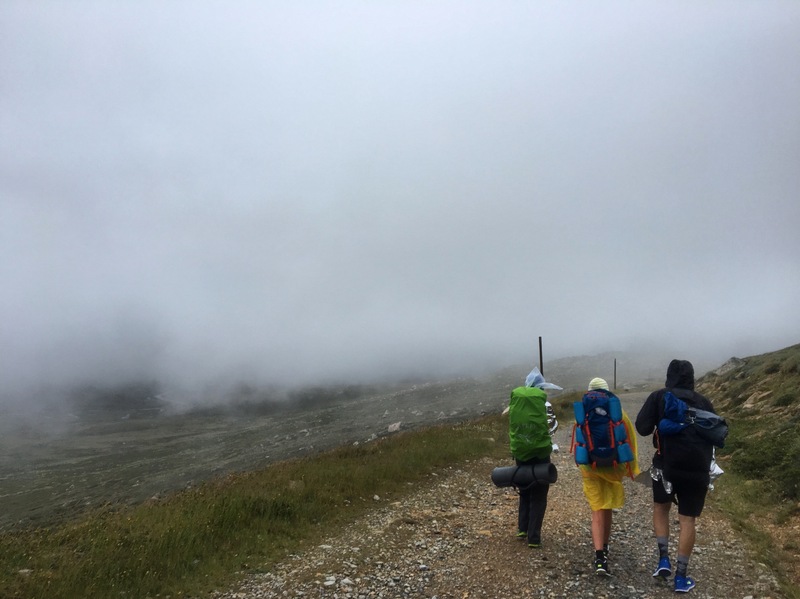 Once we found the familiar path and the fog lifted a bit, we stopped to rest and eat, which started to lift everyone’s spirits rise again. The rain did not give us many breathers though, it was fairly consistent on the walk out. We stopped again at Seamans Hut, then quickly continued on as we could hear storm number two coming for us. We reached our cars just as it started to unleash on us. We stripped off, trying to contain our sopping wet gear from water-logging my car and jumped in – turning up the heater and turning my car into a humidity box. Back in Jindabyne we changed into dry clothes and stuffed ourselves with hot carbs and strong coffee. There really is nothing better than refuelling after something so gruelling. I got back into the drivers seat and took us six hours back to Sydney, dropping off both the girls then heading straight into a steaming hot shower the second I got home. Honestly, I loved every minute in this breathtaking part of the world, it was certainly an adventure! I used to go camping a lot when I was in my twenties. I belonged to an outdoor club which had a calendar packed with weekend camping trips, multi-day backpacking walks, canyoning and lots more. I was one of the only members under 50 years old, but that was great as the members had heaps of gear and were very generous to share with those without. I couldn’t afford much so I used to be gratefully kitted out by the community. 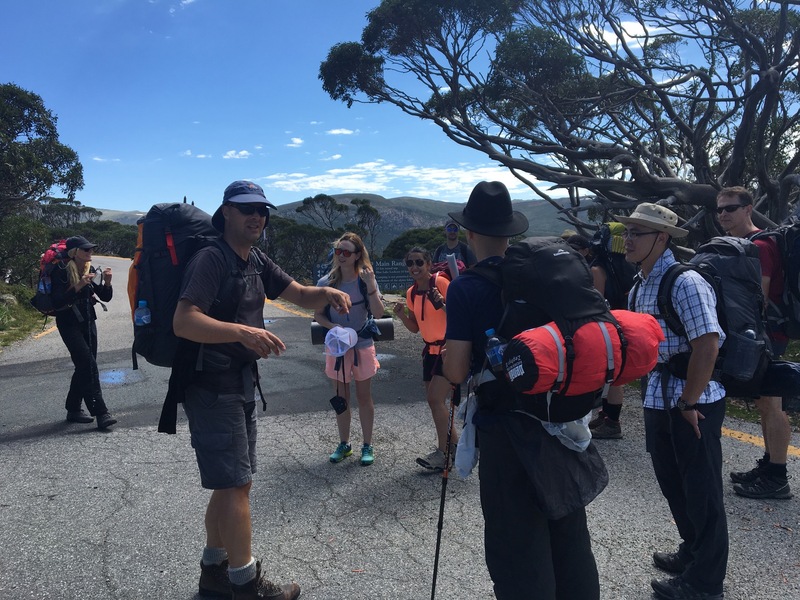 When I moved to Sydney I no longer had such an active group to go on adventures with and I lacked so much gear so my weekend adventures became more city-based. Then a couple of birthdays ago a good group of friends bought me a tent. I’ve been wanting to go camping with it for ages but planning a weekend trip always seemed ever-elusive. Why does our heart’s desire often end up on the back burner of a busy life? 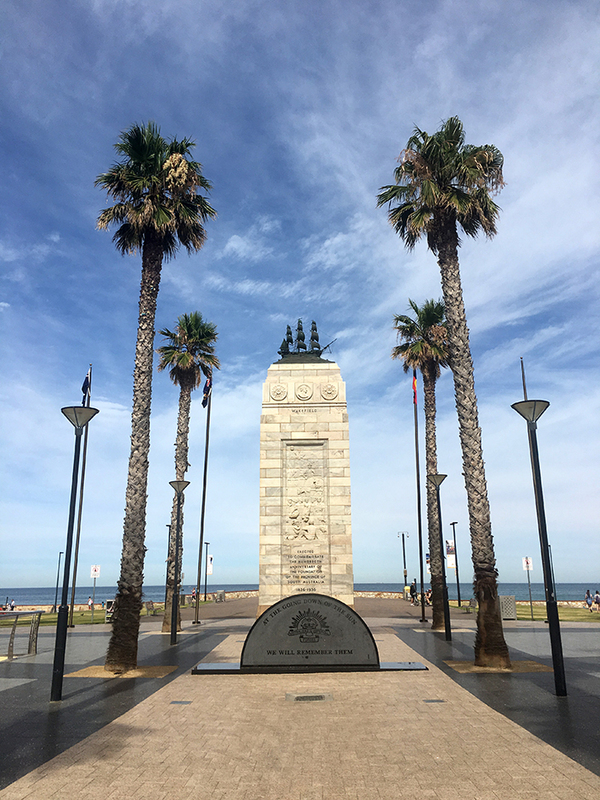 Despite our late return from Kangaroo Island the night before, day 6 of our one week holiday in Adelaide had us waking up early for our next adventure. What were we going to do now? Well in my research earlier in the week I found Escapegoat Adventures, a mountain bike tour company with great ratings on Trip Advisor. Well, sometimes you have to step out of your comfort zone! I really liked all the info on Escapegoat’s website, they sounded very considerate of all rider levels including beginners so I pitched the idea to my sister and she gamely agreed to give it a try. 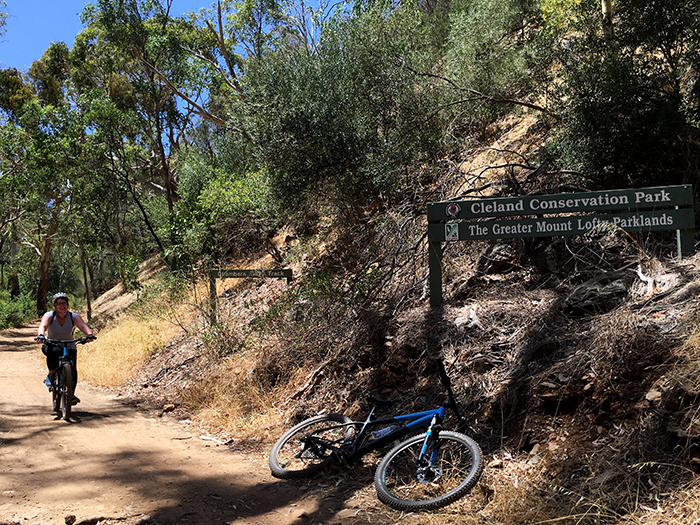 We booked online for their 4 hour Lofty Descents tour in Cleland Conservation Park. Wang Wang and Fu Ni are the only Giant Pandas living in the Southern Henisphere! Why are they here? Well, they’re here to baby-make! That and help the international community to build scientific data and understanding of sustainable habitats for Giant Pandas. China have loaned Wang Wang and Fu Ni as part of the worldwide program to study the pandas’ nutritional requirements and reproductive biology. 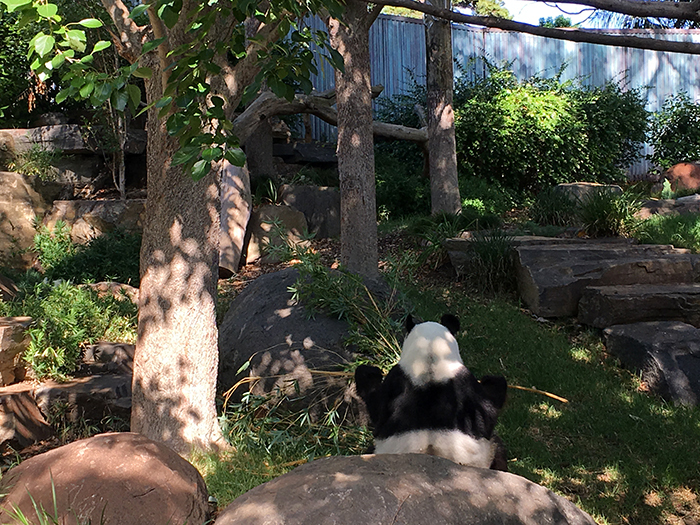 As the only pair of Giant Pandas in the Southern Hemisphere Wang Wang and Fu Ni had enabled a completely new set of scientific data highlighting the differences between hemispheres and how it affects pandas’ biology. We were lucky to go when we did, a couple of months after they stopped the Panda Encounter indefinitely due to the breeding program. Our first adventure on our second (and last) day on Kangaroo Island was to go koala visiting. Despite the island being called after a different Australian animal, there is actually a huge koala population there. I saw more koalas here on one day than I have ever seen in my life! 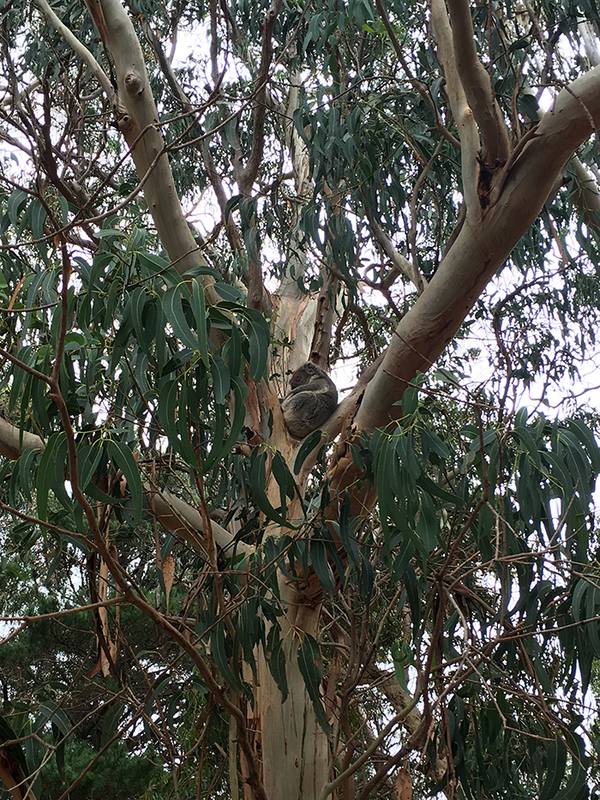 We drove to the Hanson Bay Wildlife Sanctuary where we were free to wander among the eucalyptus trees at our own leisure, our heads craned backward, eyes glued upward at the tree branches. We didn’t have to go far to spot them – in fact we saw a mum and baby in a tree along the driveway! 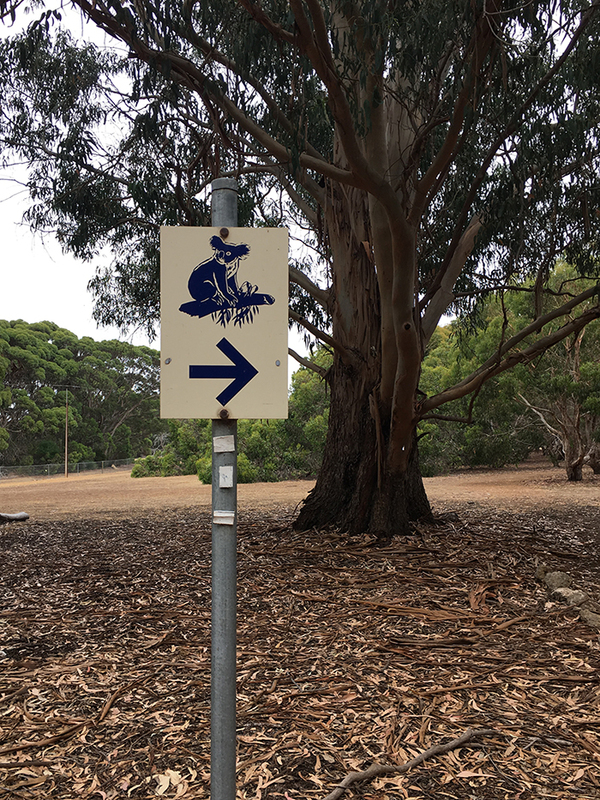 We had a whole week for our trip to Adelaide so we decided to spend two of the days on a trip to Kangaroo Island – I’m so glad we did as it was the highlight of our trip! We wanted to make the most of our time so we booked to go with Adventure Tours Australia. 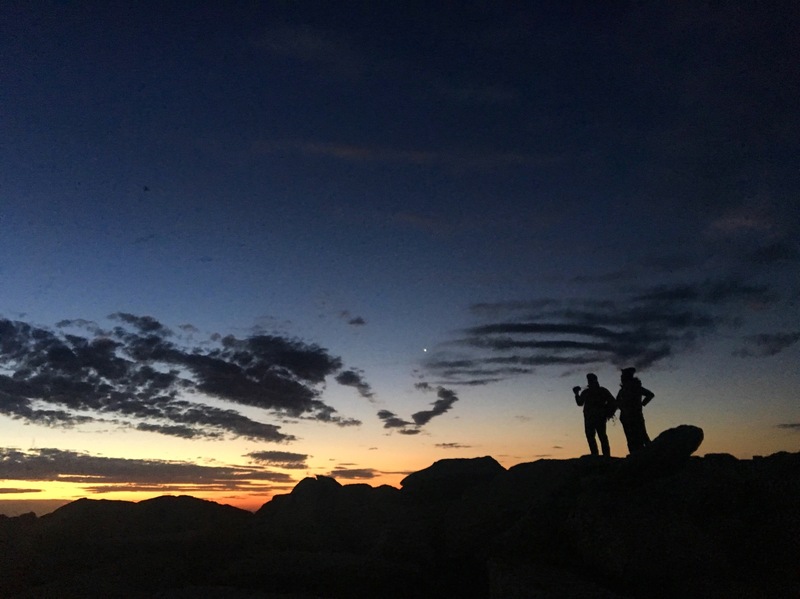 My sister had been on a tour with them in Western Australia and had an excellent experience so we booked on the 2 day Kangaroo Island Explorer trip which cost just over $400 – and was worth every cent! Starting bright and early on day 1 we were picked up from our hotel by a mini-bus and then transferred at the bus interchange onto a large coach to Jervis Cove where we would get the ferry to Kangaroo Island. We intended to spend our third day in Adelaide making the most of the city’s free bike program, which is open to everyone, everyday. Free bikes are located all around the city at places like tourist attractions, education centres, and hotels, and can be hired for daylight hours just by providing ID. It sounded like a great way to enjoy more of the path by the River Torrens, especially as the path runs all the way from the CBD to Henley Beach via the Linear Park Trail (more information is provided on the SA Trails website and on the Bikely website). Unfortunately, despite our grand plans it was not to be. Free bikes can’t be booked ahead, it’s first in first served so we decided we better get in early. We walked to one of the university campus bike hire locations but sadly temperature restrictions kicked in! Bikes won’t be hired out on days forecast to reach over 38 degrees. This was a disappointment as we thought we’d be able to handle the heat considering we were starting so early in the day, however it is good to have safety precautions for the Australian heat. 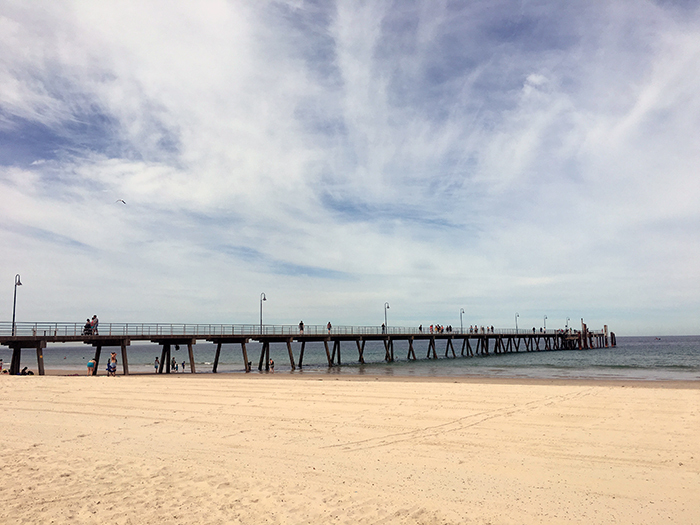 We decided to get the tram to Glenelg Beach and walk along the coastal path there instead of cycling. The tram was easy enough to navigate to using the Metro trip planner again. Glenelg is at the end of the line so it was obvious when we arrived – especially the fresh salty air and beach greeting as right at the tram stop. 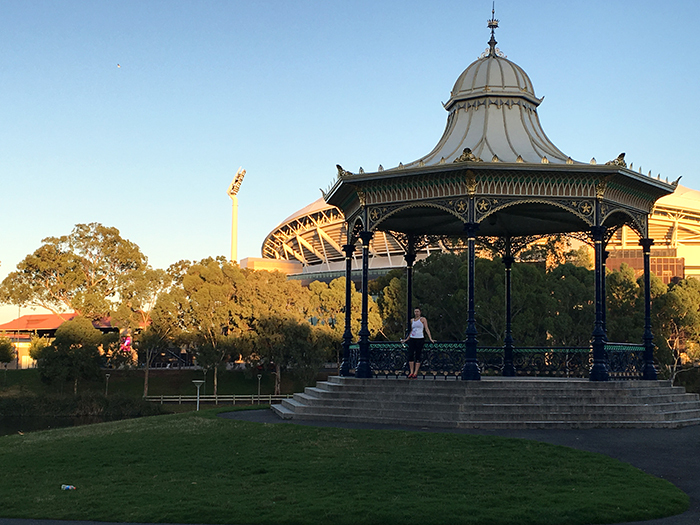 Our second day in Adelaide began with an early morning walk along the River Torrens. We were up and out the door before 6.30am, I was eager to start the day on a healthy note as I knew it was going to end up being pretty indulgent by the end of it. It is all about balance (and easing guilt ;-)). We headed past Rundle Mall, and over to the Elder Park Rotunda, which was erected in 1882 – making it 101 years older than me!